Gold Medal's Bronco Pop 2151 is well worth the investment.Silver frame with Red Dome. Heavy duty twin hanger arms. Heavy duty kettle drive motor. 120 Volt, 1700 Watts, Solid welded frame. 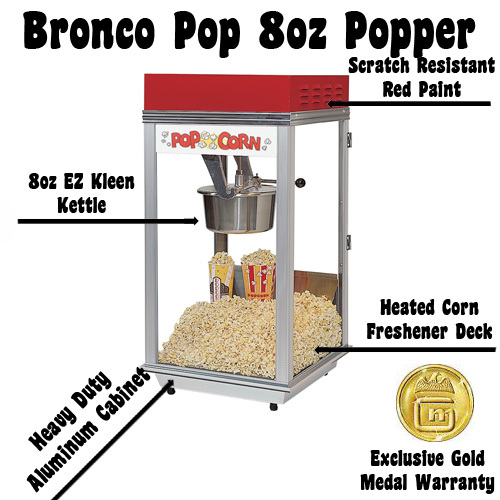 The Bronco pop would make a great focal point and serve up fresh, hot, delish popcorn batch after batch. Comes complete with Gold Medal's warranty. This machine is over sized and best if shipped by truck. Lighted sign models available. 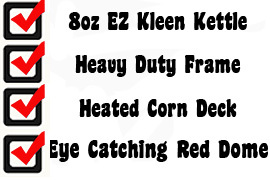 To avoid additional ship charges, please call to place order and discuss shipping options.